You know your trusty steed is getting old when a team of factory-trained mechanics at the local dealership spends an hour troubleshooting the power steering system (“we couldn’t figure out why it wasn’t working”). I should note that the car doesn’t have power steering. 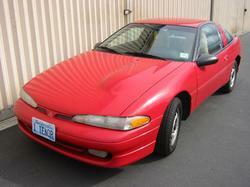 You see, my ’93 Eclipse has the dubious distinction of being the oldest vehicle they see at the local Mitsubishi dealer. Few have ever worked on the 1989-1993 body style before, so ironically it’s a new car to them. Before anyone leaves a comment asking why I take a 12 year old car to a dealer, the price and service are actually better than what I could find elsewhere. I think that’s because as the car aged, part supplies dwindled and now the largest (and therefore cheapest) supply of parts is actually from the OEM. Nearly 170,000 miles and the thing just keeps on ticking. My theory is that with no power windows, doors, seats, brakes, or steering, there’s really not much to go wrong. Unless the engine blows up or I get into an accident, it’s never going to die. Which is both good and bad. It’s good because I haven’t had a car payment since 1997. And it’s tough to argue with 40 mpg or cheap insurance rates. Not to mention that I don’t stress out about the occasional ding or dent. 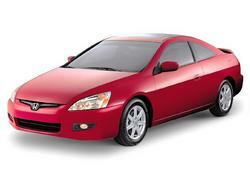 On the other hand, I test drove a 2004 Honda Accord V6 coupe today, and talk about a time warp! Apparently they’ve made some advances in the last 12 years. Built-in XM satellite radio, dual climate control, heated seats, six airbags, satellite navigation. I won’t even get into how it performed, except to say it has 260 horsepower versus 93 hp in my Eclipse. This was not my father’s Oldsmobile. It wasn’t my father’s Oldsmobile’s sticker price either. I bought the Eclipse brand new for just over $10,000. The Accord tipped the scales at $27,000, though that was MSRP for a full-tilt model with all the options. I also looked at a Nissan Titan. If I settle on an SUV, it would probably be something like this. I could transport airplane parts, tools, bikes, and maybe even the full score to Carmina Burana. Not to mention the fact that I’d feel a lot safer in a Titan than I do in my lightweight sports coupe. even though the new cars have all the bells and whistles, there is something to be said for the old work horses. with gas prices the way they are, your little gem has a great many advantages.